How did the majority of the German population go along with Hitler when approximately 90% professed to be "christians"? 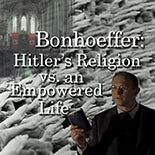 Dietrich Bonhoeffer took a stand against Hitler’s religion. He didn't just believe the bible, He wanted to experience it. He asked the right questions and made a difference in his world. Lazy, well-meaning people who don't take responsibility to be a Kingdom of Priests create Hitler's "church." Know why you believe what you believe and combine it with Faith. Jesus EMPOWERS us to KNOW HIM by His Spirit and to live HIS LIFE by His Spirit, so that we can start a revolution and make a difference...for all who believe. Bonhoeffer: Sorting Through the "Ethics"